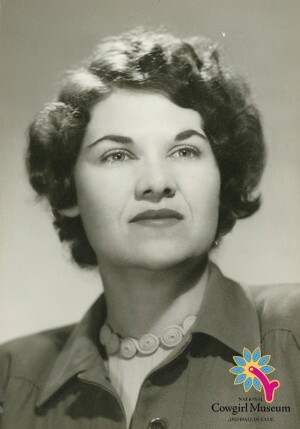 Frances Rosenthal Kallison was born in Fort Worth, Texas, but spent most of her adult life in San Antonio, Texas, with her husband at their Diamond K Ranch and general store. The Diamond K Ranch was known for their award-winning Polled Hereford cattle as well as hosting Wild West barbecues through the USO for soldiers. In 1947, she helped found the Ladies’ Auxiliary to the Bexar County Sheriff’s Mounted Posse, a precision horseback riding and mounted drill team, which performed for everything from charity events to cameos in John Wayne movies. Kallison also had a passion for researching and documenting Jewish history in Texas, and contributed many scholarly articles to publications. She co-founded the Texas Jewish Historical Society, and oversaw the creation of an exhibit on Western Jews at the University of Texas at San Antonio.